To help you get your online campaign running quickly and easily, we offer a number of Addon Service Options to our campaign website packages. These options can be ordered at any time. Available for any website, except the Enhanced Website Package, where this services is included. Save time with initial content setup. We’ll arrange your site text and images for a pleasing design. We incorporate best practices to your material for search engine optimization (SEO). After that, it’s all in your control. We send you worksheets to help get you started. This site setup is performed ONCE with the materials provided. Available for the Lite Package and Monthly Option. Turn your template-based design into a custom look. We’ll create a website header with your campaign colors, logo, background and candidate head shot. We also modify your site colors, font, background and more for a unique design. Need a campaign logo? We’ll create one for you with our custom design – plus we’ll give you a high-res version to use in your print materials for FREE. Sample designs. We will resize and modify your website header for use as your Facebook cover image and Twitter account background. We match your images to the exact size specifications of the respective sites. Analytics and Webmaster Account Setup: We will install Google Analytics on your site so you can monitor your site traffic and see where your visitors are coming from. Setting up your Google Webmaster account will allow us to submit your website’s sitemap and ensure your new and future pages are quickly indexed. Website review: Your site can’t rank well if it isn’t optimized. We’ll check your site for basic SEO to make sure the site is search engine friendly. This includes your site page titles, meta descriptions and checking that the proper keywords exist in your page copy. OnlineCandidateLinks.com Profile: We’ll create and optimize your candidate profile on our candidate directory. This listing will help tie together your website and social media profiles while providing an additional place to control your message. Site launch press release: You provide some basic information, and we’ll draft a press release announcing the launch of your website. Once it’s approved, we’ll post the release to a press release syndication site. Includes the services of the Site Launch Option and Social Media Graphics above, plus setup of your campaign Facebook Page and Twitter account. This includes rescaling and modifying your website header for use as your Facebook cover image and Twitter account background. Email is still the gorilla of online marketing. The money really IS in the email list. Email is crucial to political fundraising, as most online donations come in through email. Save time and get your email campaign started the right way. Let us set up and configure your Mailchimp account so you can concentrate on your campaign. Implement your custom template into your MailChimp.com admin area. Integration of a customized MailChimp email signup form into your campaign website. Setup of custom reply message and subscriber ‘Thank You’ landing page on your website. Bonus: Our Campaign Letter Templates and Email Letter Templates ebook bundle. Need help writing your site content? We can take your material and copy edit it for grammar and clarity. We can also copy edit your press releases and campaign materials. Contact us for details. Send banner ads to key voter households. By matching a physical address to a specific IP with extreme precision, IP Targeting becomes a secret weapon for political campaigns. Tailor and target your advertising messaging to specific audiences for greater impact and response. Reach specific targets for .75 to $1.50 per household. Learn more. All plans come with great support by knowledge base, email and phone. No hidden fees! 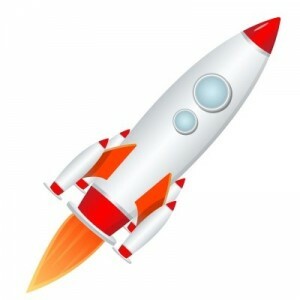 Site Launch, Social Media Setup and MailChimp Setup options can be ordered with your website or at a later time. Questions? Call Carol at 866-460-0995. 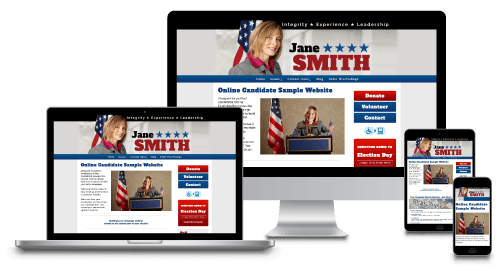 Political candidate web design for Republican, Democratic or Independent candidates. Sign up and get our Campaign Tips Guide - it's FREE right now! We are fully based in the USA.